Hand signals volleyball and the signal sequence for officiating. 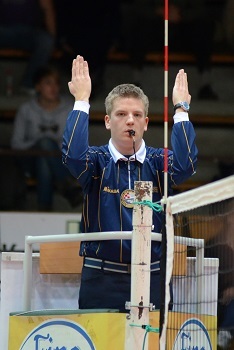 The beckon for serve is the most used signal by the first referee. This signal is used to start each rally. Start with the arm straight out from the shoulder. The arm is also parallel to the floor. Hand is open with the palm facing forward. Whistle first, then signal. You don't want the palm facing upward or downward. After whistling, bring the hand to the opposite chest. The whistle should be separate from the signal. Whistle first, then beckon. As the second referee, you won't mimic the signal. Extend the arm on the side of the team that won the rally. The arm should be straight out from the shoulder. The arm should be parallel to the floor with the hand open and palm facing forward. This signal is used by the first referee and repeated by the second referee to indicate which team won the rally. When the ball lands in the court within the boundary lines, this ball is indicated "in". Signal by extending the arm with hand open toward the court. The arm should be 45 degrees away from the body. Point near the intersection of the attack line and sideline. The thumb should be next to the index finger without space between the fingers. Remember, blow the whistle the instant the ball contacts the floor. Next, gather information if necessary to determine whether the ball was "in", "out" or "touched". When the ball goes out of bounds without being touched by the defender or the ball hits the antennae or crosses the net outside the antennae, you signal by raising both arms while keeping the upper arms parallel the floor. The forearms are perpendicular to the floor with elbows kept at a 90 degree angle. Hands are open with palms facing behind you. Your arms should be a comfortable distance apart to allow you an unobstructed view. You should easily be able to see your referee partner, the court and the benches beside you. Your signal should not look like a touchdown signal. This signal indicates the ball was touched by the player on the side the ball went out of bounds. Put your arm at 90 degrees on the side of the team that touched the ball. Brush the finger tips once with fingers of opposite hand. When the ball passes completely beneath the net between the two net posts, you signal by extending your arm and pointing with the index finger to the middle of the line. Use the arm on the side of the team that committed the fault and the signal should be stationary. There is no sweeping motion of the arm hand or finger. The same signal is used when a player commits a line violation of any kind. When a player is at fault, indicate the player at fault with an open hand. Avoid drawing a line with a finger. Use the same signal for a player that's off the court at service contact. The centerline signal is identical for a ball crossing under the net. When the ball is caught or thrown, signal by extending your arm slightly toward the court at waist height with hand open and palm up. Slightly cup the hand with fingers together. Start at waist height and raise to shoulder level. Keep the hand away from the shoulder and outside the body line. Not in front of the body, but out to the side so everyone can see. When you signal multiple contacts, raise your arm with the first two fingers extended. It's the arm on the side of the net where the fault occurred. Signal slightly to the side and above the head. Not directly in front of you. Remember, multiple contacts are illegal during a teams first attempt, provided they are done by a single playing action.